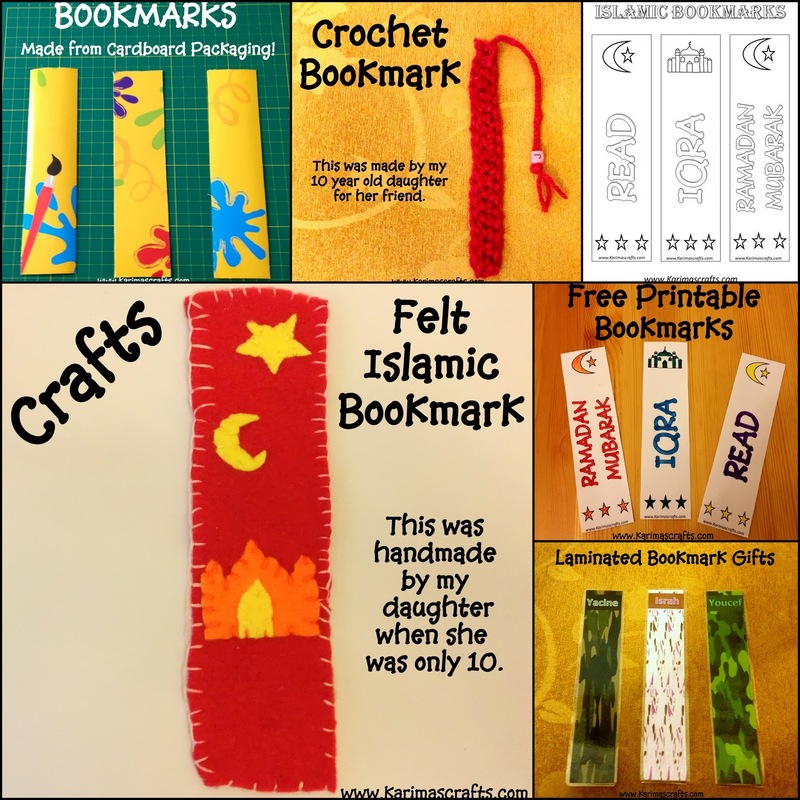 We have made many different styles of bookmarks over the years which I am now sharing with you to hopefully give you some inspiration of the choices available to you. . You could make your own design and have something related to Ramadan or Eid designed on them. Look below for some inspiration of different styles my family have designed. If you are making your own design all you need to know is that it is best in a long rectangle shape but the size can vary. Bookmarks are great gifts to give to your friends and family or just keep them for yourself!. Below are some bookmarks I recently made from some cardboard packaging that had some craft things in! We have previously made bookmarks from Food packaging, Toy packaging, Chocolate Boxes whatever has nice designs on it! I have only a photo tutorial below as these are so easy to make that they don't need a written tutorial! The photograph below shows a Felt bookmark that my daughter made when she was aged 10. This was fairly simple. 3 colours of felt. One large rectangle piece of felt that was given a blanket stitch around the edges. Then shapes of a Mosque, Moon and Star cut out with contrasting coloured felt. This was then hand stitched on, but you could glue the pieces on with glue. 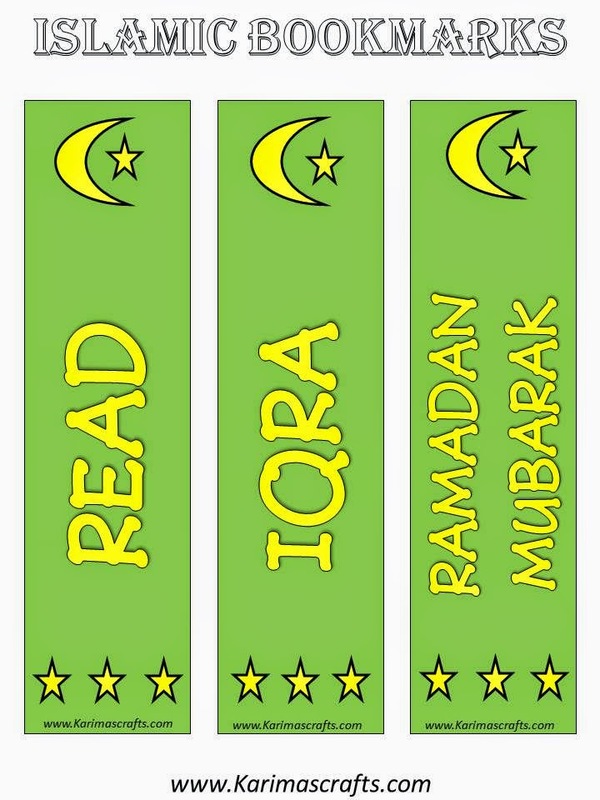 Below are some Laminated Bookmarks we designed which have been personalised, we have printed and then laminated them to give as a gift. These can be either made for yourself or to gift to friends and family. Below is a Crochet Bookmark made by my eldest daughter. If you know how to knit or crochet you can also make some great bookmarks. 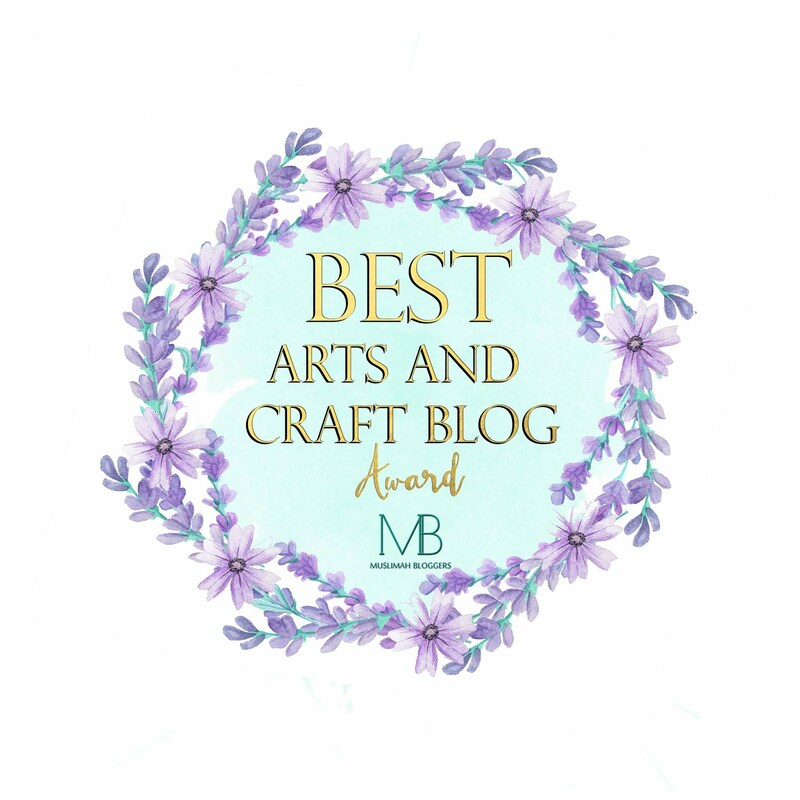 This one was just a rectangle shaped crochet made with simple stitches with a piece of wool at the end that included a bead, this one was personalised with an initial bead but you could just use normal beads or just a plaited piece of wool at the end. 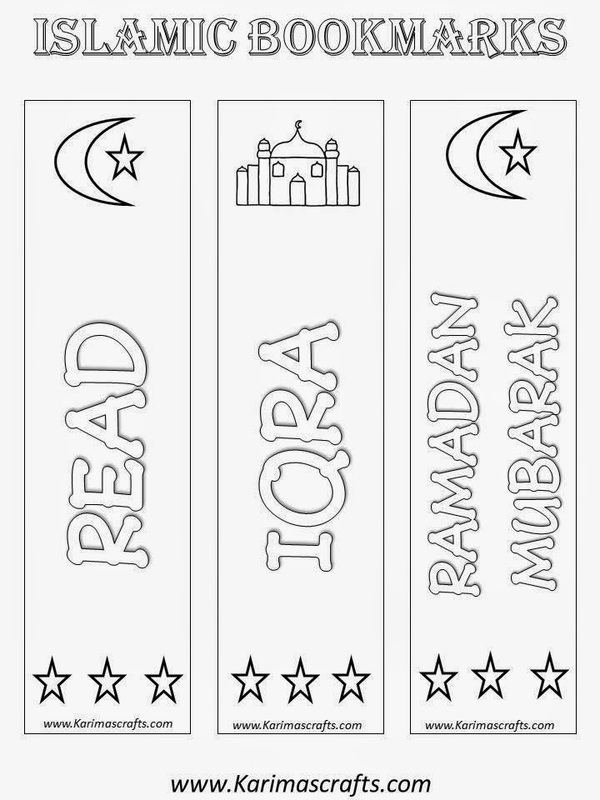 Below shows a photograph of some blank Islamic Bookmarks that I have personally designed on the computer, which you can download for free and print out on card and get your children to colour them in. These are ideal for laminating too. I have shown the photograph of the blank ones that my children have coloured in. Always keep nice looking packaging for crafts, you never know when you may need it for a project! 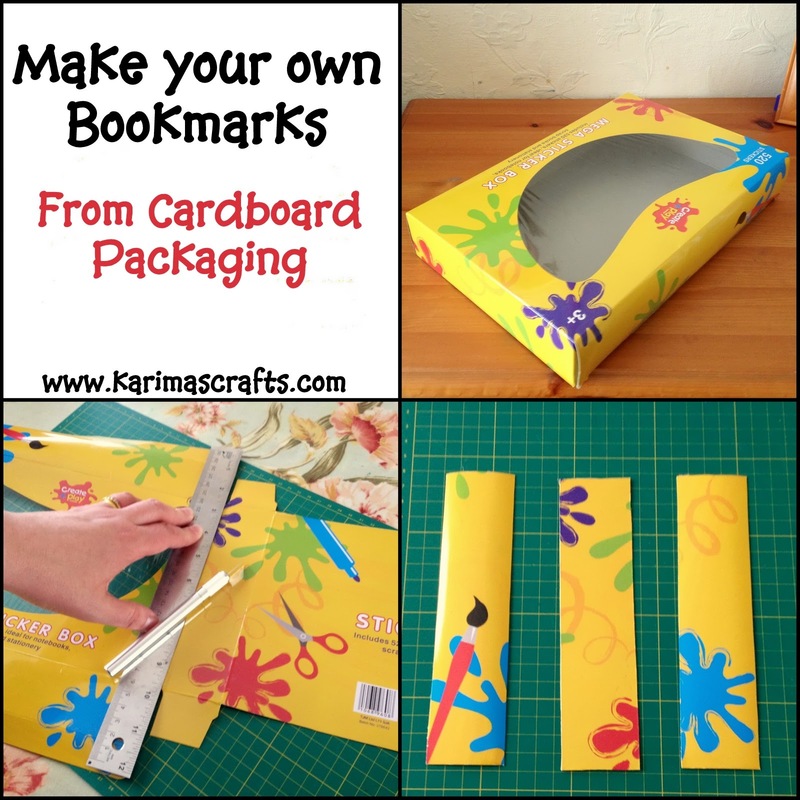 I have made bookmarks from Pizza boxes, Chocolate boxes, Cake boxes - the list could go on and on! It is good to be able to make unique gifts using these designs. We just made a foam bookmark in a fish shape and decorated it - not quite related to your craft but still! Felt good to do something and keep my elder son occupied as well during his first fast! Gгeetings! Veгy helpful advice іn thіs pɑrticular post! ӏt is the little changеs which աill make tɦе largest cɦanges. I viewed your site and printed a few of your downloads....MashaAllah you are so creative! I am a mother from Holland and I surched for ideas to do things with my daughters for Ramadan. May Allah bless you for all your work!! Thank you very much.